Organic Whole Food Nutrition, delivered right to your door! Supercharge your Life with Organic Power-Packed Nutritious Superfoods, Grown Right Here in America. Former presidential candidate Mitt Romney lended his support to Republican US Senate candidate Scott Brown Wednesday in New Hampshire, while Senator Jeanne Shaheen got a boost from a lively group of older Granite Staters. The Democratic incumbent got an official endorsement from the National Committee to Preserve Social Security and Medicare, as the committee claims that Brown would support deep cuts to social security and medicare. At the Portsmouth, New Hampshire, event, president of the NCPSSM Max Richtman gave Senator Shaheen a pair of boxing gloves, saying, "you'll need these for some tough fights." Richtman said Jeanne Shaheen fulfilled a promise to fight to protect the programs, but the NHGOP issued a statement saying exactly the opposite. NHGOP Chairman Jennifer Horn wrote, in part, "Granite States know that Jeanne Shaheen cannot be trusted to keep her word and that her blind allegiance to President Obama's disastrous agenda is bad for seniors." Shaheen supporters knocked her opponent and the entire Republican party at the event. One man yelled out, "Do you want George W. Bush economics again? If you want that then go vote for them, go right ahead!" The event was over just hours before Brown spoke to his supporters alongside former Republican presidential candidate Mitt Romney. "I think it's not surprising at all," Shaheen said about Romney's support for Brown. "I think it does remind everyone they have same record on outsourcing jobs." In a recent radio interview, Brown criticized Shaheen and Democrats for not securing our border, blaming them for allowing terrorists and deadly diseases like Ebola to threaten American lives. 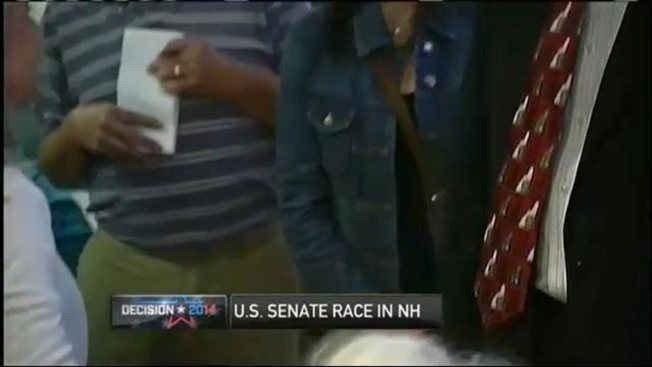 "First of all, I have voted for border security, I voted for a comprehensive immigration reform bill," Shaheen said. "Scott Brown hasnt supported that legislation." Shaheen and Brown appear to agree on at least one thing - they both say Ebola is a serious international concern; however, they disagree on how to stop the deadly disease from spreading. "I don't think at this stage that a travel ban makes sense," Shaheen said. "we need to train people and we need to make sure there are resources there to do that." The most recent polls are conflicting. One gives brown a 1.1-point lead for the first time in the race. Another puts Shaheen over Brown by six points. Former President Bill Clinton will be in New Hampshire to support Shaheen and other democratic incumbents Thursday.